Looking for a fun St. Patrick’s Day project for your kids? 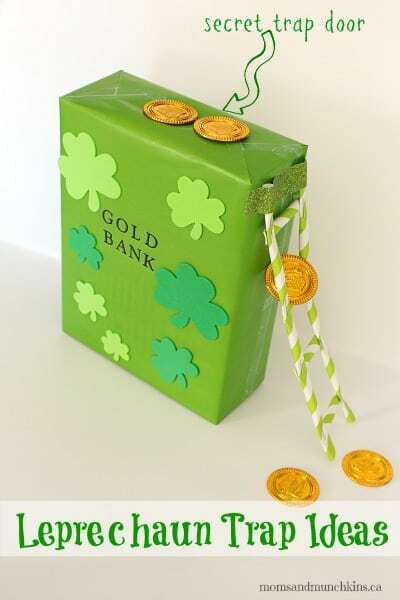 Try these leprechaun trap ideas! Who knows, you may be lucky enough to catch a leprechaun who can take you to his pot of gold! Be warned though, leprechauns are tricky & hard to catch. If you do manage to catch one, you can’t take your eyes off of him even for a second. They’re small and they can escape quickly. Still up for the challenge? Yes? Great! Let’s get started on some ideas! Leprechauns are very intelligent and it is difficult to outsmart them. 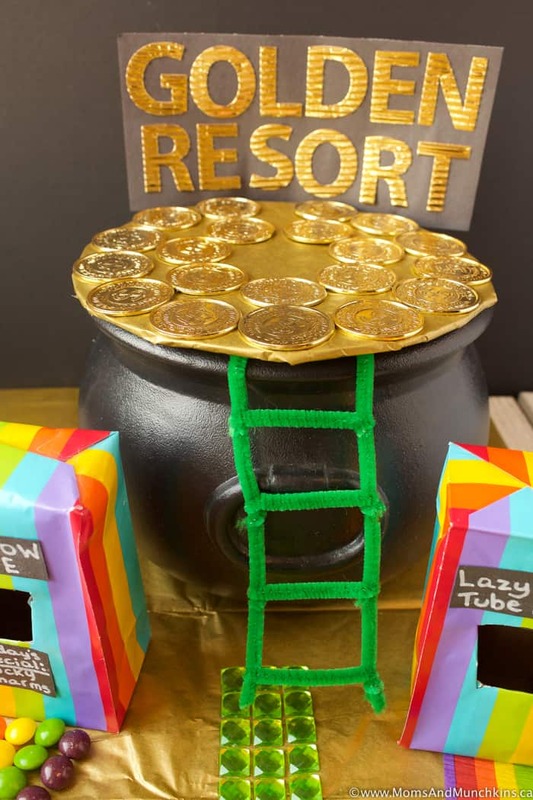 To create the perfect leprechaun trap, you’ll want to use something that they can’t resist – like Lucky Charms cereal, gold coins, a rainbow or perhaps even a jar of shoe polish. What shoemaker could resist a new jar of shoe polish?! Remember that you don’t want to injure the leprechaun so make sure that your traps are effective yet leprechaun-friendly. 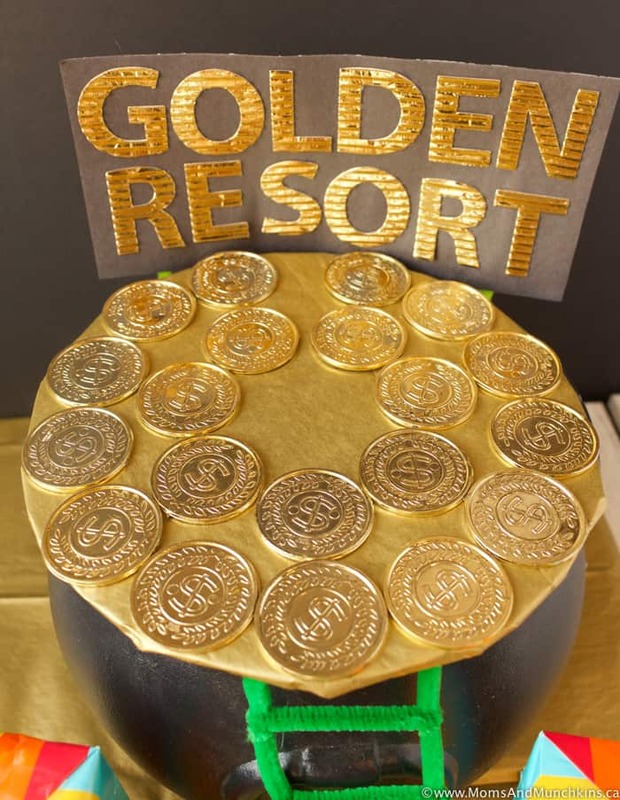 For this leprechaun trap, I decided to make the ultimate resort destination for a leprechaun – Golden Resort! 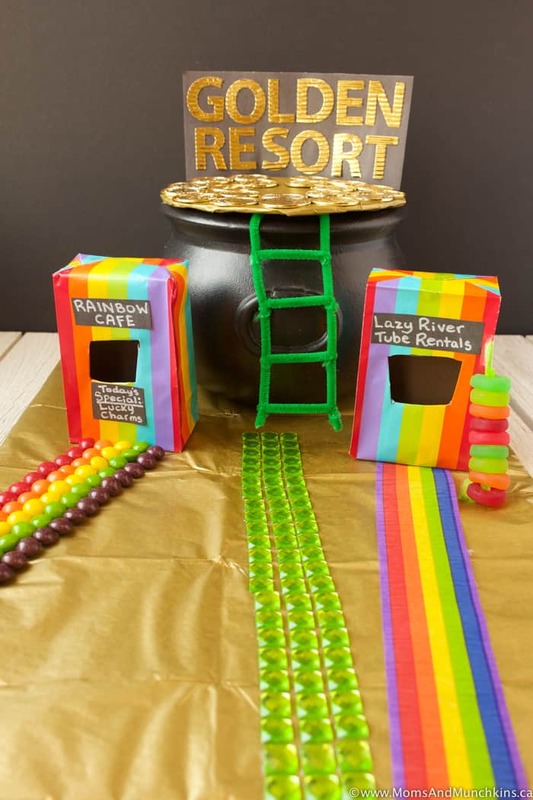 With a Rainbow Cafe serving Lucky Charms cereal, to a Lazy Rainbow River (with tube rentals, of course), to a check-in area covered in gold coins…it truly is a resort a leprechaun couldn’t resist! The catch? There is a hole hidden at the top of the gold coin platform. The hole is covered with tissue paper so as the leprechaun steps there, he’ll fall through and land down in the pot. 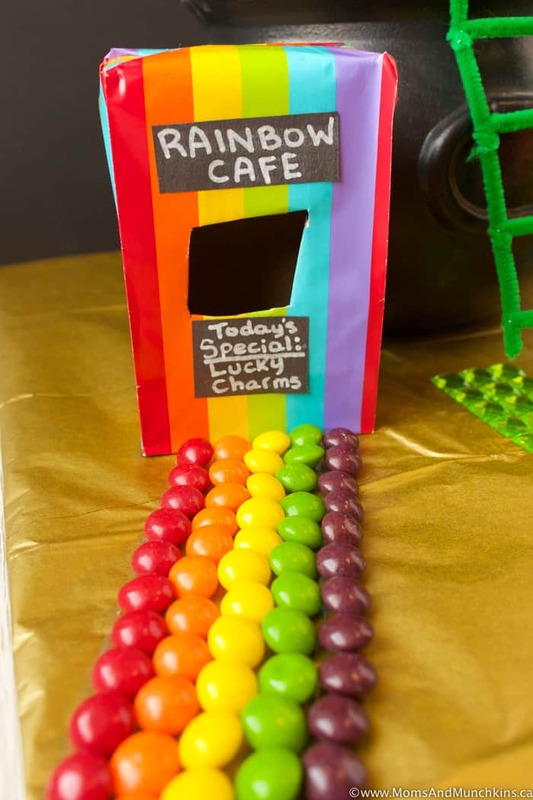 To decorate the resort, I used Skittles as a pathway to the Rainbow Cafe and rainbow streamer paper as a pathway to the tube rentals shack. 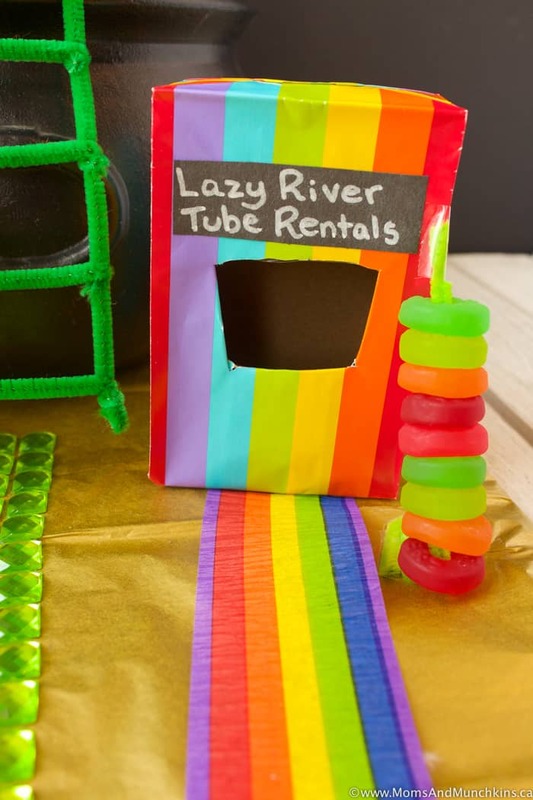 For the tubes, I used gummy Lifesaver candies. The trick to a successful leprechaun trap is to make it look appealing to the leprechaun! Using a few toy blocks, prop up an upside down laundry basket. Tie one end of a string to the bottom block and the other end of the string to a gold coin. When the leprechaun grabs the coin, the blocks will fall and he’ll be trapped under the laundry basket! Cut a hole in the top of a box and cover the entire box with green paper, stickers, drawings, and anything else to make it look inviting to a leprechaun. Place some Lucky Charms on the top of the box and leave a ladder (you can use Popsicle sticks for this) near the box. When the leprechaun steps on the top of the box, he’ll fall through the hole and be trapped inside. Looking for another creative idea? 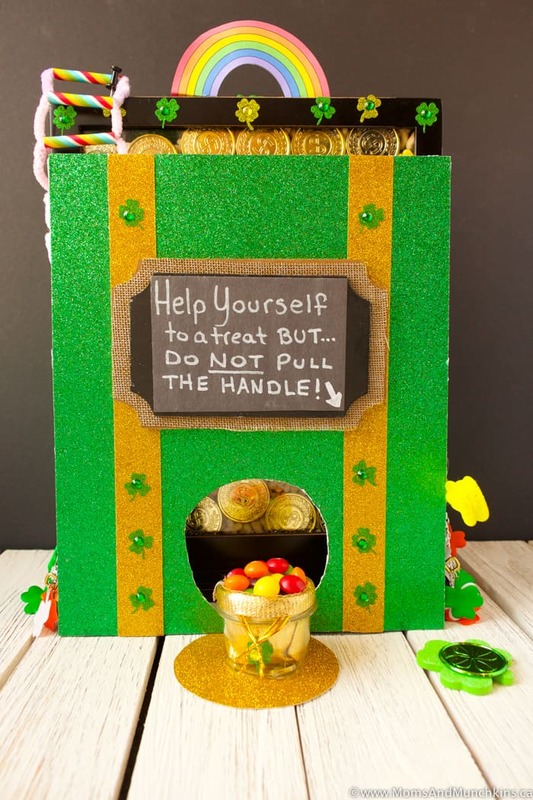 Check out this Leprechaun Trap using a shadow box and lots of treats! Like I mentioned earlier, leprechauns are very smart and are not easily tricked. Don’t be surprised if you wake up to notes from the leprechaun, green glitter, little green footprints and shamrock confetti scattered around the traps. I’ve even heard a story of a family that woke up to find that their milk had been turned green and all the the Lucky Charms had disappeared from their cupboard! 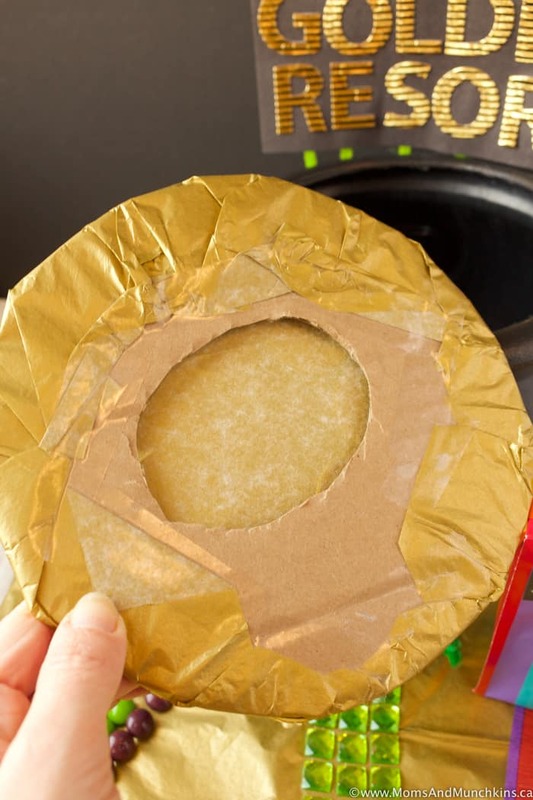 Have you ever created a leprechaun trap? Did it work? Do you have any leprechaun trap ideas to share with the rest of us? For more fun St. Patrick’s Day ideas, visit our St. Patrick’s Day page. 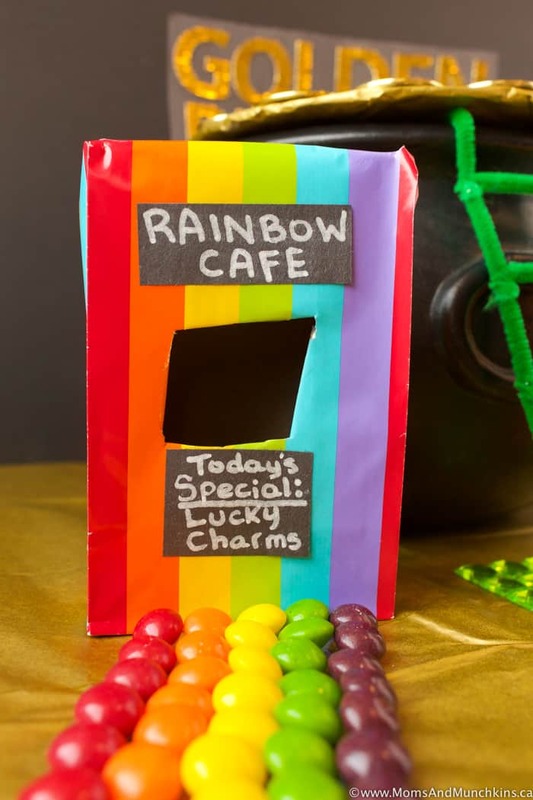 We have treat ideas (yes, leprechaun bait! ), party ideas, free printables and more! Stay updated on the latest ideas for family fun by following us on Facebook, Twitter, Pinterest, and Instagram. Great ideas for celebrating St. Patrick’s Day! Love the green food coloring in the toilet idea! I’m off to check out your site now. Happy Monday! How fun! 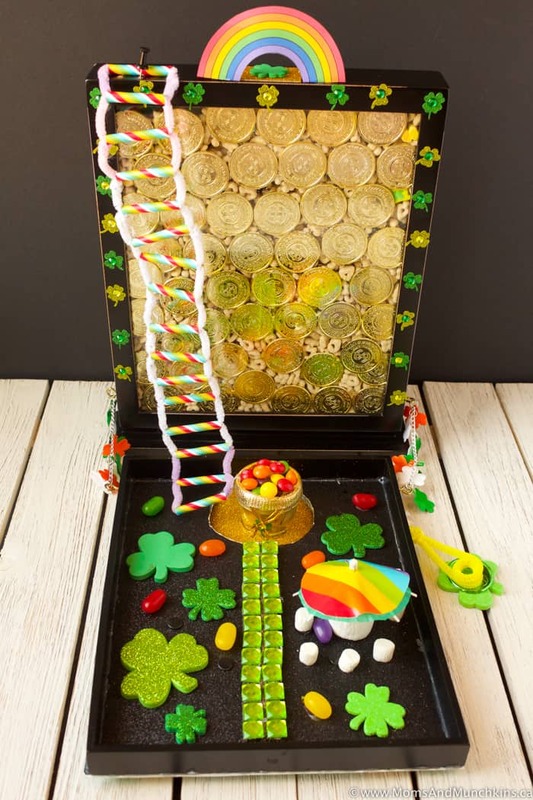 I’ve always wanted to try to make a leprechaun trap…and seeing as we live on the Emerald Isle – I wonder if it would work? Thanks for linking up to Mom’s Library, I’ll be featuring you this week at Castle View Academy.